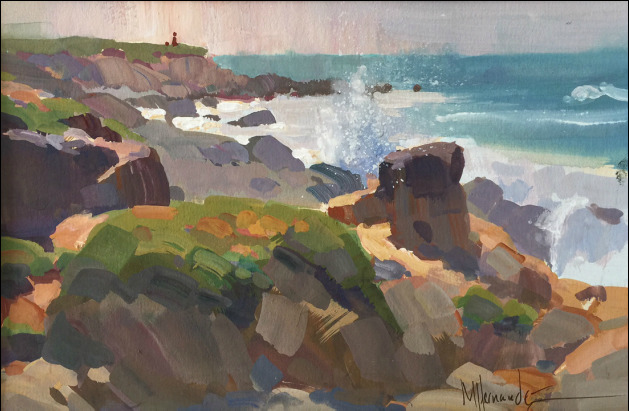 A native Angeleno, Mike Hernandez is a plein air painter skilled in gouache, oil and acrylic, who’s works have been featured in several on-line publications as well as galleries. His process began as a young child, painting still life images. Influenced by the likes of Edgar Payne, Sorolla and Franz Bischoff, Mike soon explored the foundations of color and light in the outdoors – striving to find the beauty in the ordinary. With a palette that resides at the crossroads between industrial and landscapes, he finds inspiration anywhere from the Eastern Sierra range to the muddy concrete banks of the Los Angeles River. Mike studied at Art Center College of Design in Pasadena, graduating with a B.A. in 1998. Currently he is a Production Designer at Dreamworks Animation as well as a nation-wide sought-after workshop instructor. His works can be found in several private collections around the world and we are honored to include him here as an exhibiting artist at Vanessa Rothe Fine Art.